President Peter Mercer (center) and Mark Yamout ’79 (left), recipient of this year’s Delta Mu Delta Award, with Richard and Millicent Anisfield during the dedication of the Anisfield School of Business building. At the campaign Public Announcement Gala, Allendale residents Lawrence C. and Theresa Salameno made a surprise announcement of a $3 million gift. 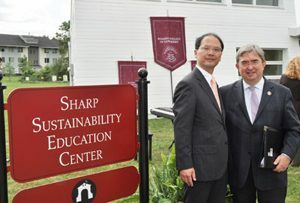 (L to R) Toshiyuki Osawa, chairman of the board and CEO of Sharp Electronics Corp. and Ramapo College President Peter P. Mercer. 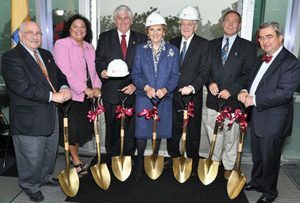 (L to R) Professor Edward Saiff, Assemblywoman Marlene Caride, Mahwah Mayor William Laforet, Elaine Adler, Mike Adler, Assemblyman Timothy Eustace and Ramapo College President Peter P. Mercer at the groundbreaking ceremony for the Adler Center for Nursing Excellence at Ramapo College. 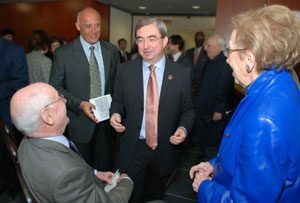 (Mahwah) – At a dedication ceremony Monday, April 28, 2008 for the Anisfield School of Business on the campus of Ramapo College of New Jersey, Richard and Millicent Anisfield of Saddle River announced a $3 million gift to the school that bears their name. In 2006, the Anisfields made a $2.5 gift to facilitate construction of the new academic building. At the time, it was the largest single gift in the history of Ramapo College. This second significant gift brings the total of the Anisfields’ donation to the college to more than $6 million. The gift will be used to complete the fifth floor of the building and to support future programs of the business school. Features will include a state-of-the-art Trading Floor Simulation Room, four classrooms, a seminar room, a board room, a director’s office and placement services offices. The Trading Floor Simulation Room will be a highly technical specialty space with ample wall space for screens and scrolling tickers. It also will be an attractive space for student clubs that manage portfolios and for on-going contests that use virtual portfolios to compete. Among those present at the dedication were Congressman Scott Garrett; Bergen County Executive Dennis McNerney; Dr. Peter P. Mercer, president of the college; and The Reverend Dr. Vernon C. Walton, chairman of the college’s Board of Trustees. The Anisfields’ initial gift of $2.5 million provided $1 million toward construction of the building, $1 million to endow the deanship, $250,000 for endowed student scholarships and $250,000 for faculty research. Previously they contributed more than $500,000 in various annual and restricted endowments. Sleek, modern and a central focus to the main entrance to Ramapo College, the Anisfield School of Business is the culmination of an exciting transition in the business school’s history. The 86,000 GSF facility meets current and projected classroom and other academically related space needs. Nearly $10 million has been pledged to date in private support for construction and programs of the business school, which cost $32 million and opened Fall 2007. The current enrollment of the Anisfield School of Business is more than 1,200 students. The school offers majors or concentrations in Accounting, Economics, Finance, Information Systems, International Business, Marketing and Management. Students may also pursue minors in Economics, Information Systems and International Business. There are 34 full-time faculty, all of whom hold advanced degrees in their teaching and research areas. In addition, many faculty members are seasoned practitioners who bring a wealth of business insight and experience to the classroom. “The Anisfields’ additional, incredibly generous gift will be used toward the completion of the fifth floor, originally designed for expansion, and to support future programs of the business school,” said Cathleen Davey, vice president of institutional advancement and executive director of the Ramapo College Foundation. The Anisfield School of Business will be housed on the lower level and the first three floors of the facility, comprising 14 “smart” classrooms, two of which will be high-tech lecture halls, study lounges, an E-mail lounge, faculty and adjunct offices, break-out rooms for seminars and a dean’s suite. This will make it possible to locate all business classrooms and faculty offices in one facility. In addition, the school will contain the Sabrin Center for Business Excellence, named in honor of Murray and Florence Sabrin; the Roukema Center for International Education, named in honor of Congresswoman Marge Roukema; and nursing teaching facilities. (MAHWAH, NJ) – As supporters and friends of Ramapo College of New Jersey gathered Friday evening to celebrate a $40 million capital campaign, a surprise announcement of a $3 million gift came from Allendale residents Lawrence C. and Theresa Salameno. The gift will support renovation of the A and B Wings of the Academic Complex, endow a Center of Excellence in British Studies and a Dean’s Scholarship Fund in the School of American and International Studies. In recognition of the gift, the school will be renamed the Salameno School of American and International Studies. 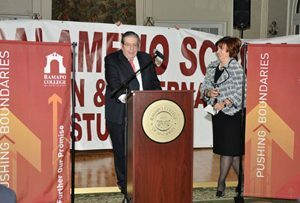 The Salamenos have a 10-year affiliation with Ramapo College and are known throughout the region as generous philanthropists for education. Their daughter, Francesca, is a 2006 graduate. Mr. Salameno, semi-retired, is Senior Executive Vice President and Vice Chairman of Permal Group Inc., (The Permal Group), part of Legg Mason, which offers investors access to hedge funds of funds. He joined Worms and Company Inc. (Permal) in 2000 as a director and executive vice president-new business development and has been responsible for product, marketing and distribution strategy .A 1966 graduate of Cornell University, he received his J.D. degree from the Cornell University School of Law in 1969. Mrs. Salameno, a professional chef, is a member of the Ramapo College Board of Governors and serves on the Executive Committee. She is a member of the Board of Trustees at Stonehill College, volunteers with the Bringing History Alive program at Colonial Williamsburg, is on the board of the John Fell House and serves on the Executive Committee of the Valley Hospital Auxiliary. Mrs. Salameno is active in her parish, where she is developing a new educational program for the first through sixth grade and is in the process of launching an International Youth and Business Etiquette program for non-profits and educational institutions throughout the region. The couple also volunteers with Peace First, a schools program that promotes non-violence. They share their philanthropy with the Valley Hospital Foundation in Ridgewood, the Saddle River Day School, Oak Knoll School, Colonial Williamsburg, Cornell University and Stonehill College, as well as other organizations. In 2006, the Salamenos made a $500,000 challenge grant to name the Salameno Spiritual Center. The non-denominational sanctuary for reflection, meditation and dialogue opened in Fall 2010. The $1.5 million Center is on the banks of Kameron Pond in the center of campus. The Salameno’s initial gift led to a succession of others that ultimately funded the 1,525-square-foot facility. In 2007, the Salamenos were honored at the College’s Distinguished Citizen’s Dinner for their support of higher education. The Ramapo College Foundation’s Capital Campaign had raised $35.8 million, prior to the Friday announcement by the Salamenos. Gifts were made by alumni, members of the Ramapo College Board of Governors and area corporations to fund capital projects, endowments for students and programs, and support faculty development and research. Cathleen Davey, vice president of Institutional Advancement and executive director of the Foundation, told the gathering that the campaign, the largest in the College’s history, will conclude by June 2013. However, Davey told the crowd that the Foundation will strive to far surpass the initial goal. Guests at the North Jersey Country Club Friday included donors, members of the College’s Board of Trustees and Board of Governors. More than $6 million was donated in recent years by the late Richard Anisfield and his wife, Millicent, a longtime member of the Ramapo College Board of Governors. The couple’s support made possible the new Anisfield School of Business and the Global Financial Markets Trading Lab. In 2010, after 25 years of supporting the College, Myron “Mike” and Elaine Adler gave $2 million to build the Adler Center for Nursing Excellence, to provide space, lab and equipment for the College’s rapidly expanding and highly acclaimed nursing program. For more information about the campaign, and opportunities for giving, please contact Cathleen Davey at 201-684-7612. (MAHWAH, NJ) – Friends and supporters of Ramapo College joined the community today in dedicating the Sharp Sustainability Education Center to thank Sharp Electronics Corporation for more than 20 years of support during their 100th anniversary year. Since 1989, Mahwah-based Sharp Electronics Corporation, the U.S. subsidiary of Japan’s Sharp Corporation, has supported a multitude of projects on campus totaling more than $1.63 million, including donations of electronic equipment to funding for a performing arts theater, a fitness center and most recently a space dedicated to educating students throughout the region about sustainable living. Support for the Sharp Sustainability Education Center aligns with the company’s social and environmental interests. One of Sharp’s core values is to contribute to global environmental conservation by creating both energy saving and clean energy-creating technologies. Sharp is a world leader in the production of solar panels and strives to conduct business in an environmentally conscious manner. The Center is a demonstration space for sustainability practices and includes classroom laboratory space, hosts forums for discussion of and symposia on sustainability issues such as water use, open space, land use and development and alternate energy. It is also the headquarters for the New Jersey Higher Education Partnership for Sustainability. Toshiyuki Osawa, the Chairman of the Board and CEO of Sharp Electronics Corporation, attended the ribbon-cutting ceremony. Sharp provided financial support for the construction of the Center and also significant solar products for demonstrations and educational instruction inside the building. In addition, the corporation has been a Business Partner since 1990 and has been a loyal and generous donor to the Distinguished Citizens Dinner, the Annual Golf Outing and the Performing Arts Dinner Series. The Center also allows for advancement of the College’s education outreach programs by offering classes to area schoolchildren. Paul Hoffman, President and Chief Executive Officer of Liberty Science Center served as keynote speaker for the dedication. “I am delighted to take part in the dedication of the Sharp Sustainability Education Center,” said Hoffman. “Ramapo College has a rich history of environmental and sustainability education. The completion of this Center further highlights the College’s commitment to these necessary and important issues, as well as the advances in our understanding and implementation of them.” As part of its efforts to contribute to conservation and education, Sharp recently donated an LCD video wall to Liberty Science Center. Sharp Electronics Corporate Vice President and Ramapo College Foundation Board member David Alai, and other senior management leaders from Sharp were present. The dedication is one of the highlights during Sharp’s 100 year anniversary celebration. Other major donors to Ramapo College and our Environmental Studies alumnae attended the event, as well as faculty and students. Other local corporate partners such as BD, Prudential Financial, Stryker, UPS, BMW of North America, Sony, New York Stock Exchange Technologies, KPMG, and Price Waterhouse Coopers also participated. (MAHWAH, NJ) – As friends, nursing students, faculty members and administrators looked on, Myron and Elaine Adler broke ground today for Ramapo College of New Jersey’s new Adler Center for Nursing Excellence. The Adlers have been consistent supporters of Ramapo College for more than 25 years. Mrs. Adler is a member of the Ramapo College Board of Governors and the couple has provided numerous gifts to support the College’s Annual Fund, student scholarships, the Center for Holocaust and Genocide Studies, the Distinguished Citizens Dinner, the Golf Outing. They have also provided a capital gift for the Adler Theatre in the Berrie Center for the Performing and Visual Arts.